"We are in a situation that goes beyond morality." Psychologist Chris Kelvin (George Clooney) shuffles aimlessly through each dreary day and finds no joy in life. His apartment conveys the image of a lonely, mourning figure who feels little love for the world. He strolls down the rainy streets, listens to the problems of troubled patients, and presents a face devoid of expression. What has driven this apparently intelligent, handsome man into such a desperate condition? Chris' blank mask hides heart-wrenching grief, and solace seems unattainable. Based on Stanislaw Lem's classic 1972 novel, Solaris tackles serious psychological complexities within a science-fiction setting. Many viewers will also recall Andrei Tarkovsky's earlier adaptation, which is often heralded as a monumental motion picture. Instead of trying to copy this film (a la Gus Van Sant's disastrous re-shoot of Psycho), writer/director Steven Soderbergh presents his personal interpretation of Lem's vision. With a cast comprised of a mere five characters, this intimate creation raises questions about our deceptive memories and false perceptions. Last winter, audiences expecting a George Clooney outer-space thriller rejected the story, some even fleeing the theater in disgust. Removing those preconceived notions reveals a sometimes irritatingly slow, yet surprisingly memorable, tale of love and possible redemption. Chris' life takes a drastic turn when he journeys to discover the mystery behind a stranded spacecraft located near Solaris. An eerie message from his friend Dr. Gibarian (Ulrich Tukur) begs for his help. When Chris arrives on the craft, several crew members are dead or missing, leaving only two people on board, the slightly crazed Snow (Jeremy Davies, CQ) and stern Gordon (Viola Davis). Both have obviously undergone serious trauma somehow connected to Solaris. Although it resembles a circular planet, the colorful entity is actually an unexplained type of living being that can examine a person's innermost memories. It also creates entities who physically match individuals that strongly resonate in their subjects' minds. When Chris' deceased wife Rheya (Natascha McElhone, Ronin) materializes one night, it will lead him to reconsider his own perceptions of reality and the couple's past experiences. The exact nature of the Solaris creations is not apparent, but they do look exactly the same as the original human versions. But appearances can deceive. Is Rheya an exact duplicate of Chris' wife, or does her appearance only match his memories? The evidence seems to correspond with the second conclusion. Rheya only remembers things from Chris' perspective, and possesses no separate ideas. This paradox generates a conflict for Chris. He must choose to embrace this lesser version of his wife or reject it as an alien. It also causes trouble with Gordon, who has definitely seen enough of these creations. While unexplained events continue to occur, Solaris becomes brighter and more prominent, apparently waiting for Chris' final decision. Soderbergh and Clooney deserve considerable credit for avoiding the common tactic of lowering complex ideas to the most basic level. Solaris should garner interest from intelligent viewers willing to digest its thought-provoking concepts. Clooney does especially well and gives an introspective and detailed performance. That said, I will admit that certain areas do move at a snail's pace. Several moments designed to startle fall flat, and the ethereal ending lacks some needed emotional impact. The climax occurs abruptly and actually generates more questions than the few it answers. After a lengthy build-up, the plot finally seems to reach the typical climax. Once again, however, Soderbergh pulls back and makes the audience draw its own conclusions. His success in this venture ultimately depends on your own expectations of what a science fiction film should be. Image Transfer Review: Solaris may not feature numerous digital effects, but it still benefits considerably from this excellent 2.35:1 anamorphic widescreen transfer. The cold hues of the spacecraft's interior are strikingly clear and offer no discernible grain. Solaris' bright blue and red colors shine especially well and lack the blurry nature of lesser transfers. I have witnessed few superior transfers on any release this year. Audio Transfer Review: This release includes an effective 5.1-channel Dolby Surround track that nicely presents the confusing atmosphere. Cliff Martinez's score plays well from the speakers and clearly provides the proper tone. This audio transfer does rank slightly below the premier versions because it simply lacks the level of complexity. The entire sound field is utilized, but the power and clarity do not match the best DTS and Dolby Digital offerings. This disc also includes solid 2.0-channel Dolby Surround tracks in English, French, and Spanish. Extras Review: Solaris offers a much-needed commentary from writer/director Steven Soderbergh and producer James Cameron. There is plenty to discuss here, and the two fail to disappoint by covering some of the pivotal ideas. It works solidly, but still misses a few of the key elements I was hoping to discover. They do not spend too much time drawing comparisons with the original novel or Tarkovsky film, which is a minor disappointment. However, both exude intelligent demeanors and have an enjoyable chemistry that makes everything less dry. Viewers looking for more understanding can also access the original screenplay. This disc also includes two documentaries that provide a nice overview but fail to really explore the film's concepts. 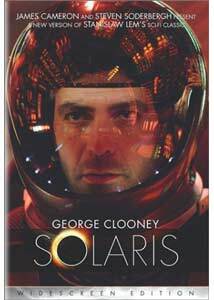 Solaris: Behind the Planet is easily the better of the two and does, at least, cover the film's origins with Cameron, Soderbergh, Clooney, and others. Instead of just providing the basic clips, it matches them with behind-the-scenes production footage. Several deleted moments also quickly appear during the 17-minute featurette. The best elements discuss the set design and digital effects but only run for a few short minutes. Very little substance exists in the HBO special, which includes dull plot summary, clips, and interviews with the key players. Matched with the other documentary, this 12-minute piece is mostly a useless inclusion. The trailers section offers two Solaris previews and glimpses at two upcoming releases. The theatrical teaser works nicely by showing only the ship and mysterious entity. Unfortunately, the main trailer focuses on the love story and basically ignores the plot complexities. The upcoming previews are for Peter Weir's Master and Commander�a seafaring adventure starring Russell Crowe�and the Merchant Ivory production Le Divorce, a comedy featuring Kate Hudson and Naomi Watts. Without the strong weight of Steven Soderbergh, James Cameron, and George Clooney behind it, it is doubtful that a major Hollywood studio would have backed a project like Solaris. The complex story does possess name recognition from Lem's novel and Tarkovsky's heralded film, but they barely register a blip with mainstream audiences. By utilizing a deliberate pace and leaving numerous questions unanswered, Soderbergh alienated viewers grown accustomed to bloated science-fiction epics. While admittedly slow at points, Solaris does present several intriguing dilemmas that should inspire thoughtful discussion long after its abrupt conclusion.